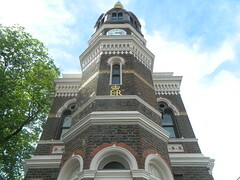 Melbourne appears to be inching ever closer to proceeding with an Airport Rail Link, with the Federal Government promising to contribute $5bn towards the project, in spite of the ample evidence that $5bn would be far better spent on the Melbourne rail network by extending it to Rowville, Monash or even finally electrifying the Melton line. Major credit to the State Government for their response to Turnbull's pure populism play. I've long had a sense that Daniel Andrews knows full well how poorly airport rail stands up to a proper cost-benefit analysis relative to almost any other possible similarly scaled improvement to Melbourne's rail network. The state government has been insistent that if this project proceeds, it needs to be about more than just getting businesspeople to their flight on time on the dozen or so times a year the majority of them will ever travel. and employment hub for the entire western region. 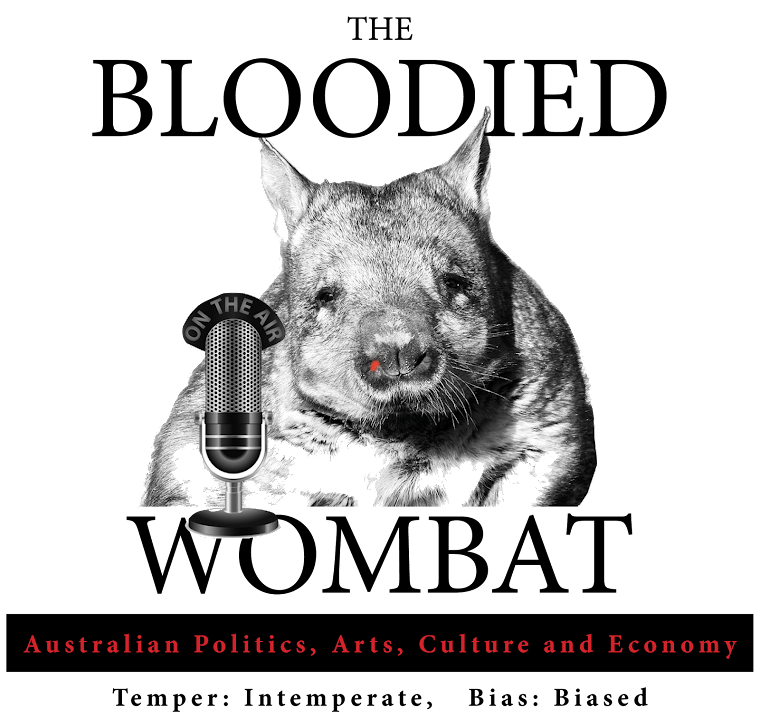 We've discussed this as nauseum here in the wombat burrow and so I won't bore you further tonight, particularly as the debating horse appears to have bolted somewhat. Some form of airport rail link is going to happen, and so as we've equally insisted before, we are about making sure if it goes ahead that it delivers the maximum benefit to the Melburnians who matter most - those who presently have tenuous access to viable public transport options. Doing it for Zone Two, as we like to say. 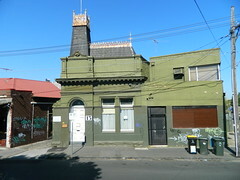 The state government is correct to situate the real scope of this project's potential in the context of "unlocking the City's west", and of seeking to ensure, as Melbourne's growth rebalances west now that little opportunities to expand east remain, that we don't repeat the mistakes our planners made over the part 50 years in creating vast greenfields development zones situated in public transport black holes, thereby locking their residents perpetually into inequitable, antisocial and unhealthy transport options largely confined to car dependency. The Regional Rail Link project remains little understood and unheralded by most Melburnians, but I maintain it is the single most important infrastructure project that a Victorian government has undertaken in my lifetime. It is unquestionably John Brumby's greatest legacy. In years to come Melbourne will realise that this project has nothing to do with V/Line, because it's eventually going to be incorporated into the metro rail system, and it creates the opportunity to plan vast new greenfields residential sites around heavy rail. As one also suspects that sticking to the original, more ambitious Metro rail project while canning the East-West Link will come to be seen as Daniel Andrews' eternal gift to Melbourne. In time I hope this decision will come to be seen as the first significant move by any Victorian politician to effect a recalibration towards mass transit investment which in turn set Melbourne up to become one of the great, if not the eminent industrial and social fulcrums of the Asia-pacific region. The government also deserves credit for placing the project in the context of the possibilities to enable fast rail to Geelong. So we're seeing something of project's aims being lifted towards the horizon in two key dimensions - better enabling a public transport-oriented future for the West, and advancing the decentralisation agenda by rendering Geelong a viable commuter city to Melbourne. I intend today to dwell today mostly in the former dimension as to a large extent the big questions around fast rail are all technical-boring ones regarding how to do it. My main agendas are seeing the line divert via Avalon, and at what point are we going to electrify the regional rail link anyway? And I have two broad based pleas for the government to insist upon being part of the project if we are to have at least the benefits column of Turnbull's vanity project maximised. The below illustration shows the state government's approximate preferred route for airport rail as the leftmost orange track. 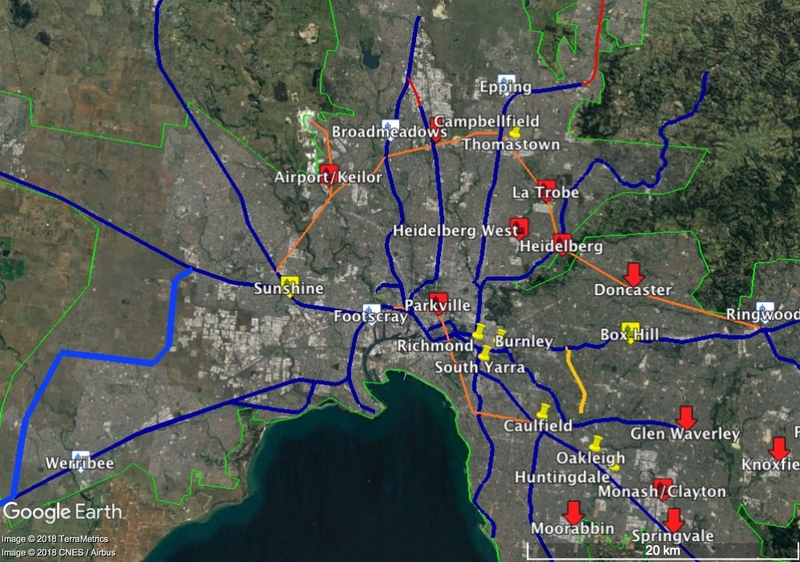 Green is the Urban Growth Boundary, light blue is the existing tram network and dark blue heavy rail. 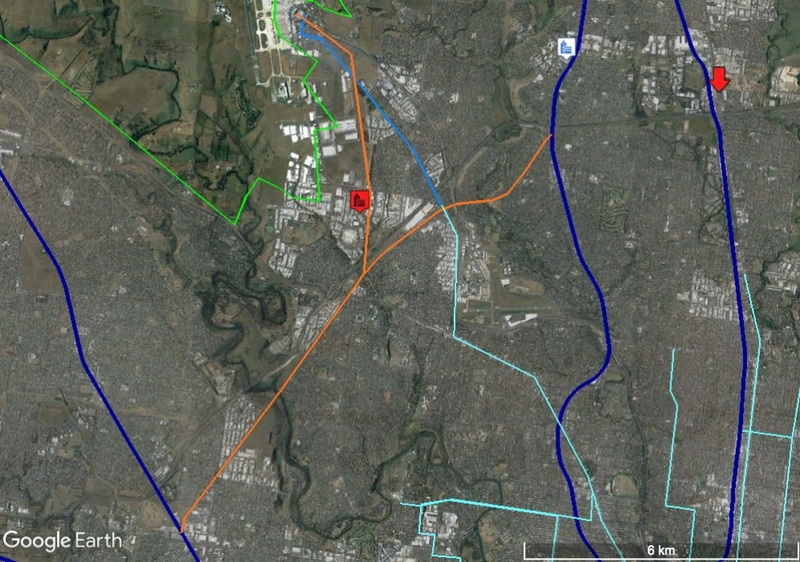 My proposal is to also electrify the entire remainder of the Albion freight corridor to where it reconnects with the Craigieburn line at Jacana (the right hand orange spur). The point of this is to allow for services running Broadmeadows-Footscray (or potentially further), leaving the airport link free to run express past all but two of my new commuter stations I'm suggesting below. 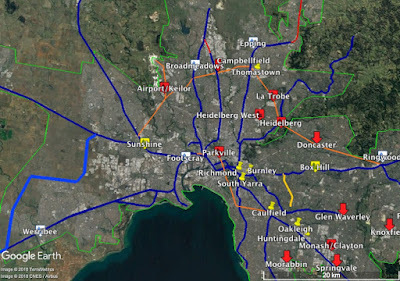 We've then plugged one of the largest heavy rail blackspots in Melbourne, created viable local heavy rail transit options into several existing and potential employment centres, and furthered the goal of de-radialising the network. Furthermore the entire northwest has indirect heavy rail access to the airport. And this is as much about acknowledging that the airport is actually one of the few existing concentrated employment zones outside Melbourne's CBD as it is travellers. Their journey would necessitate one change at the new Keilor Park station (more below) to connect with the airport rail link proper, but Melbourne folk are only unused to interchange travel because of the existing radial nature of the network. The point of this full electrification is really about giving people in the northwest a viable heavy rail transport option to local employment centres, while also facilitating the growth of those centres. I can already hear the armchair experts slingshotting out of their recliners. "Don't be a fool, you know every new station adds a huge amount of time to the journey, and we need to be competitive with road." Well, bulldust. The main benefit of airport rail to commuters is RELIABILITY. So long as we can tell people exactly what time they will be at the Tullamarine terminus, they will plan their journey accordingly. They will not do a mental calculation on exactly how long a hypothetical road journey might take. Regardless, as per above, we will only catering to two of the new stations on the actual airport rail link. 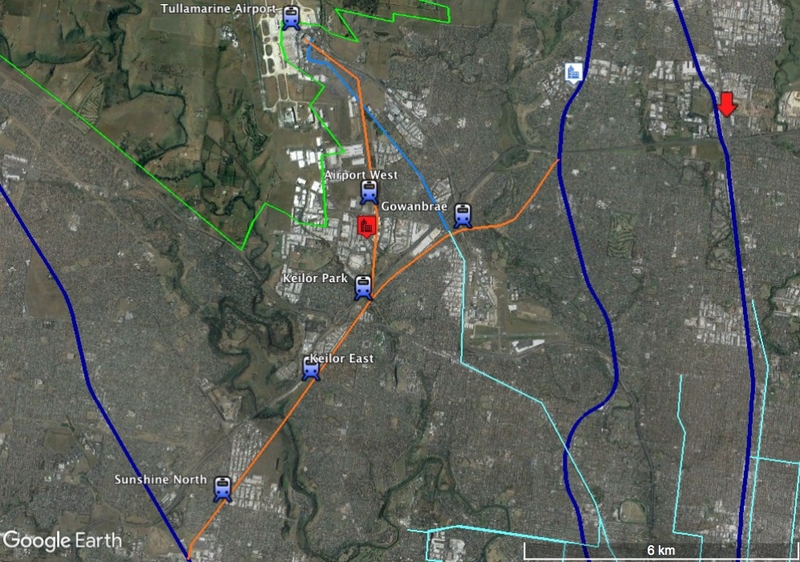 So, my proposed airport rail would have stops at the CBD obviously and travel via the Metro Tunnel to stop Footscray, Sunshine then three new stations - Keilor Park, Airport West and Tullamarine Airport, which would provide for a reliable service that is time-competitive with road and which delivers maximal integration with the existing commuter network. The picture is completed with new stations at Sunshine North, Keilor East and Gowanbrae, all servicing either existing employment centres or greenfields residential, approximately in the locations set out below. You will also note the above diagrams include the sometimes mooted extension of the 59 tram line to the airport. It's really an afterthought, but I was interested in seeing what the airport's potential public transport catchment looked like with that added. I think it's fair to say this would not be used by travellers, this is purely to create a maximally public transport enabled employment centre whose effective catchment would now reach all the way down to Essendon. I intend to spend more time breaking down some of the more recent journey to work data to gain some idea what percentage of Tullamarine airport and related facility employees, live within this catchment, and ideally that data would inform the decision of whether the tram connection was worthwhile. And to ice this cake properly, if we scale back a little and look at a similar treatment for the inevitable Upfield Line extension (which already exists as unelectrified single track, shown in red below), and further back still to incorporate the Regional Rail Link (royal blue), with its potential for well planned and managed greenfields public transport oriented development, then the risen creation looks something like the image below. Now, that starts to look more like my definition of a NETWORK - a decentralised lattice of interconnected nodes. 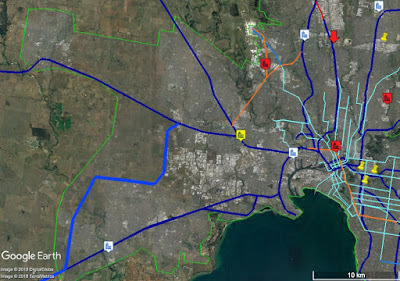 And if we accept the other great wombat thesis that a radically decentralised rail network is necessary to secure Melbourne's future, the city's west suddenly looks full of potential for building great, sustainable communities with easy rail access to decentralised job centres. And if we were to scale back even further, and if readers will allow me to bleat once more about the transformative potential for Melbourne of one or more outer suburban orbital tunnel/s (see HERE for the detail of THAT complete scheme), then ultimately I would suggest this entire project be considered but stage one in a much grander scheme linking all the major current and potential northern suburbs employment locations with heavy rail that operates radially IN to them as destinations in their own right. Now, that to me looks properly transformative. And we are at the point where we need change on that scale for the sake of Melbourne's future. The current process of incrementalism is really just locking in the car culture by fiddling with small capacity improvements for rail while roads soak up the majority of the available resources. But one of those resources - space - is very finite, and we are surely approaching the point where we are physically unable to cater to much more incrementalism. Let's make Turnbull's airport rail boondoggle the beginnings of Melbourne's quantum leap into a 20 minute city that actually exists outside the usual rhetoric. Great informative post for the readers and travellers. Travellers to see new developments at this airport. New station for airport rail should be there for travellers so that they could be able to take the benefit of it. Great post.